– What Painting Is, by James Elkins, Routledge, 1999.
by Alva Noë, Hill and Wang, 2009. – Ways of Seeing, by John Berger, et al, Copyright 1972; Penguin, 1977. This article focuses on painting, but if you’re into something else—music, dance, ceramics—these ideas probably apply to your creative endeavors, too. I’ve been working full-time as a painter for four years. Before that I earned a Ph.D. in Theory and Cultural Studies at Purdue University where I taught courses on an array of topics from film theory to ballet. In both of these lines of work I’ve found that the way we usually talk about painting blows right past the most important thing in painting: the paint, mixed and applied by hands that try and err and retry. What’s going through a painter’s head as she works? Let me put most answers to that question into two categories: “Art History” and “How-to.” This is an overgeneralization, but follow me. Under “Art History” we have critics and historians in coffee-table books, documentaries, classrooms, and museums. Their goal isn’t so much to encourage painting as to discuss how paintings operate in the culture once they’re dry. They present intriguing ideas, but they don’t offer many practical tools for those of us who deal with wet paint. 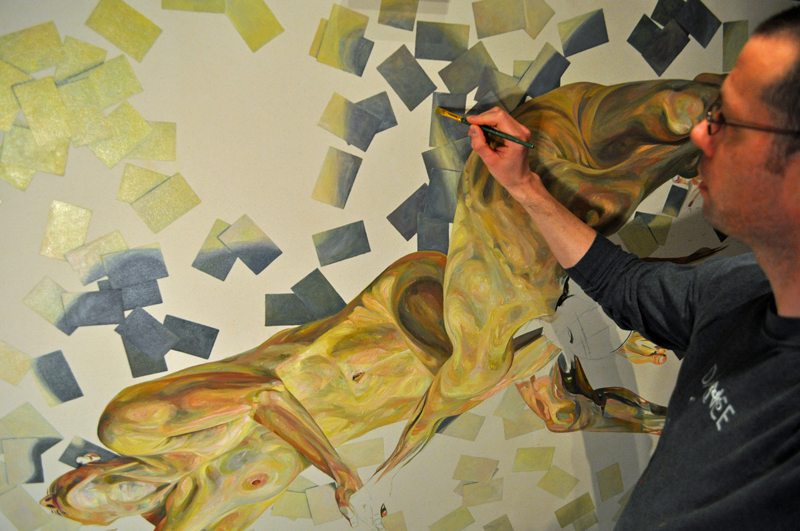 Painter Paul X. Rutz works through a painting in his Portland, Oregon, studio, May, 2015. After a period of study, many painters enter a middle ground between How-To and Art History. We’ve learned the basic moves of painting—how to prep a surface, how to manage single-point perspective, how long to wait before varnishing—and we find ourselves out there alone, past the last step in the manual, trying something we’re a little afraid might not work. We act out most of our painting hours here, in this space between taking advice and our work being shown. I kept my eyes open for a book on painting written from that point of view, something that could help me show students how our discussions about painting come after a painter thinks in painting. I was surprised to find that book had been written ten years before Noë’s. In What Painting Is, James Elkins, a professor of art history and criticism at the Art Institute of Chicago, carves an important space between the rigid advice of How-To and the dry-paint appraisal of Art History with his focus on materials and how we use our bodies to move them. The book is built around full-color photos of tiny sections of famous paintings across eras and styles—from tight figuration to wide open abstraction: Titian and Sassetta to Jackson Pollock. Elkins explains why: “I am using very small details of paintings in this book to make the point that meaning does not depend on what the paintings are about: it is there at a lower level, in every inch of canvas… with the thoughts of the artist’s body at work. 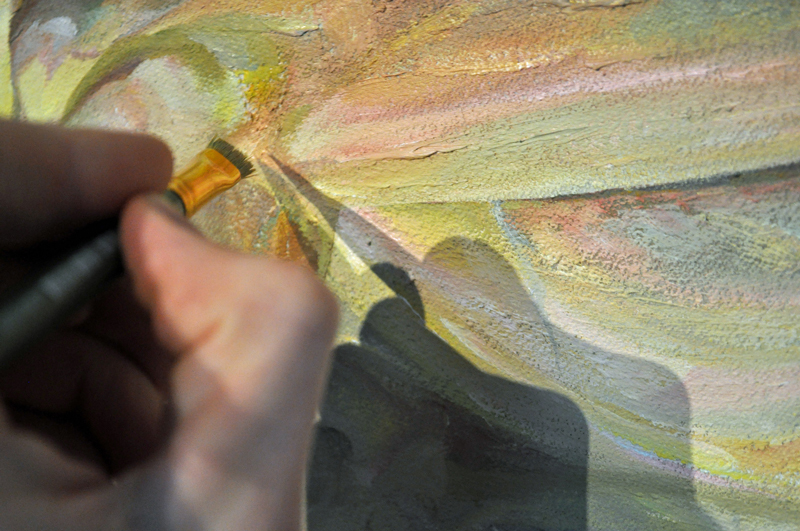 A brushstroke is an exquisite record of the speed and force of the hand that made it” (p. 96). Forget what’s depicted for a moment; this book is about what paint does. With this focus on materials we get a book both rigorous and inclusive, full of spirited invitations to do, to act and think in paint. Elkins wants us to find frustration. This isn’t a relationship with frustration in which we accidentally encounter it and learn to manage it by shrugging our shoulders and letting it trickle off us like water off a poncho. Elkins is talking about actually courting failure, building struggle and frustration into our day and naming it something else: creative practice. He declares early and often, “Book-learning is a weak substitute for the stench and frustration of the laboratory” (p. 5). While Noë uses dance as his metaphor for consciousness, Elkins uses alchemy as his model to describe painting. He is by no means the first author to do that. Most who compare painting to alchemy aim to tease out the poetic, magical, or spiritual sensibilities that painting can evoke. (Elkins does wade into those weeds in some chapters, and those are the weakest parts of the book, in my opinion.) For the most part, what makes this version of the alchemy approach valuable is the way he affirms the attitude of the alchemical laboratory. He writes, “Alchemy is the old science of struggling with materials, and not quite understanding what is happening: exactly as Monet did, and as every painter does each day in the studio” (p. 19). The focus is process, not outcomes. Alchemy presented this way exposes a method of organizing our practical approach in the studio that is both essential and really hard to teach because our standardized-test-based culture values outcomes over process. Elkins wants to remind new painters and all viewers of paintings that good painters know they don’t know, and that not knowing is essential. “Alchemy and studio art exist, you might say, on the first-grade level: they depend on intuition and naiveté, and they are ruined by secure knowledge” (p. 40). I can imagine him arguing that painting belongs alongside love and happiness and other precious pieces of humanity that need some rescuing from today’s impulse to reduce them to something quantifiable. 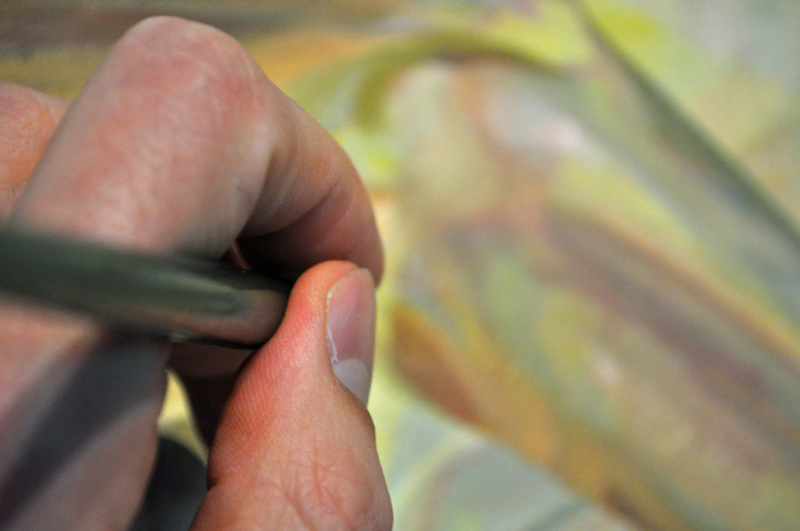 Paul X. Rutz works on a painting in this tight close-up. “Monet paid strict attention to the motions of his wrist and arm, and the varying pressure of his brush against the canvas. He must have spent hours at a time getting his media just right, testing it again and again by dipping his brush into it, or tilting the palette to see how fast it ran. All of it was done without words, but with intense concentration” (p. 39). I imagine a lot of headaches. Monet gained his painting knowledge through years of practice in a laboratory-like climate of chemical stink and dead ends. That’s the prescription throughout this book: try, watch what happens, practice, and repeat it all with some variation to see what else happens. It’s about patience and the use of our senses. Of course putting all our patience into painting has its drawbacks, and Elkins drops a loaded word in a late chapter titled “The Studio as a Kind of Psychosis.” This idea may be unpalatable, but I think he hits on something central if rarely acknowledged here. “It is important never to forget how crazy painting is. … painting is born in a smelly studio, where the painter works in isolation, for hours and even years on end” (p. 147). That has consequences. I find when I spend too many weeks in a row doing exactly what I want (which is work all day on a picture) my comfort zone gets narrower and my patience for the rest of life gets shorter. Wrestling with my own thoughts all day can become a kind of masturbation, a feedback loop of self reference. This is part of why I work with live models and devise ways to shake up my studio practice by doing projects that depend on compromise with another practitioner. I wrote about one of those efforts, a partnership with sculptor Christopher Wagner, in this magazine last year. A close-up of a painting in progress by painter Paul X. Rutz working with a live model in his Portland, Oregon, studio in May 2015. When it comes to viewing paintings by other people, we can take this embodied approach to the gallery, looking at paintings up close, following the painter’s gestures with our hands, like a conductor practicing while listening to a recording. Elkins says he tries to feel the painting physically and let it change his own habits of moving. “I wonder if there is a way not to fall into a mood as I rehearse a painter’s gestures,” he writes (p. 97). This is useful stuff for anyone looking for a novel way to approach the next goopy-oil nose of a Rembrandt or the fine tempera strokes in an early Renaissance altarpiece. Can we make them feel alive by moving with them? “Original paintings are silent and still in a sense that information never is. Even a reproduction hung on a wall is not comparable in this respect for in the original the silence and stillness permeate the actual material, the paint, in which one follows the traces of the painter’s immediate gestures” (p. 31). So this way to consider painting isn’t novel. It’s just drowned out by approaches that favor fact. Berger, et al, chastise historians who write about a painting’s city of completion or compositional angles as if these are the sources of its emotional power. Composition and historical context matter, but they are secondary to a painting as a record of a real person’s trial-and-erring through making it. Elkins wants to hold painting apart from, say, musical composition, as uniquely embodied and uniquely based on materials. But I’d wager that many kinds of creative people—the jazz pianist, the choreographer, and my gardening grandmother—work in a similar mode, retrying and improvising with a focus on what and how they touch, letting the abstract ideas come later to explain what they’ve done. Paul X. Rutz took a military/balletic route to painting. He graduated from the Naval Academy in 2001, earned a master’s degree eight months later, then served aboard the aircraft carrier USS Kennedy (CV-67). While in the Naval Reserve he danced ballet with various small groups. After working as a reporter/photographer for the Pentagon’s press service, he went back to school to study imagery in American culture, completing a Ph.D. dissertation on art related to the Iraq war in spring 2011. Throughout, he studied painting, earning the chance to show and sell that work, and eventually he took on painting as his main vocation. Paul works in Portland, Oregon.